Maybe you've heard of her. Catherine Sanderson is better known to the thousands of readers of her personal blog as "Petite Anglaise". A 37 year-old Brit who has been living in Paris for fifteen years, Catherine signed a two-book deal in September 2006. Since then, Petit Anglaise has been translated into ten languages and she's also written a novel, French Kissing. I had the honor to interview Catherine to find out more about the journey from blog to book deal. 1. You claim you’ve always had a love affair with France. As a long-time resident, what would you say draws so many people to Paris? I fell in love with France without actually coming here. I was a teenager, learning French at school, and I fell for the language first of all and began daydreaming about coming here to live, speaking like a native, creating a life for myself in France and watching French films, reading French books... (I learned German too, but never felt drawn to Germany in the same way). I've always had trouble putting my finger on what it was exactly that exerted such a strong pull. After a spell with a penfriend in a village near Lyons and a year teaching English in a lycée in a backwater near Rouen, in Normandy, I set my sights on Paris. I think it's easier for foreigners to carve out a niche for themselves in the big city than it would be in rural France. And obviously it's a beautiful city, which I'd seen represented time and time again in films. 2. At first, your blog consisted of entertaining stories about living in Paris but then it got more personal. How did you decide how much of your life to reveal and how has that evolved over time? I don't think I made a conscious decision at any point, the blog just evolved, almost as if it had a life of its own, and the feedback I got from my readers guided me a lot of the time. I revealed something personal and got an overwhelming reaction, which made me feel able to reveal more. Being anonymous made it possible to explore feelings I might not admit to otherwise. And what I found most interesting about writing a blog was being able to explore that territory. Say the things you're not supposed to say. Admit to being less than perfect on the inside. 3. A well-known blogger in Germany once told me that as a blogger, you are like a character in a story. How challenging was it to take the character from your blog and put her into a book, especially when that character was you? When I wrote Petite Anglaise the book, I decided to look at the relationship between me, Catherine Sanderson and Petite Anglaise, my blog persona. I came clean about the few instances when I'd embellished an anecdote (usually to get a few extra laughs) and examined the moments when I'd felt uncomfortable about what I was doing (was I occasionally making decisions in my life based on how they would look when I wrote about them on my blog?) The book was, in that respect, a bit like a 'making of' Petite Anglaise, including deleted scenes (things I'd left out when writing the blog) and back-story. I found it possible to do this because the events were a little further in the past - there was more water under the bridge - and everyone involved was aware of what I was doing. Whereas when I wrote the blog things were happening in real time and I needed to be sensitive to the people who were living through the crises I described with me. 4. Do you think you would have made the same choices in your personal life if you weren’t trying to write about them after the fact? I honestly don't know how much the blog influenced my actions. I can wonder about it but I don't have any neat answer to those questions. I don't have any regrets about the decisions I made while I was writing it, even now. I think it's more accurate to say that the blog enabled me to meet new people and effectively put temptation in my way when I met a man in my comments box. But given my state of mind I'm sure if I hadn't blogged I'd still have met someone else and left my partner eventually. 5. How do you write a memoir, like Petite Anglaise, or even a blog for that matter, and not offend the people you write about? When I began blogging, with my partner's support (and later with my new man's support too), I was anonymous. Neither of them minded as long as they were not identifiable. Obviously I couldn't ask my daughter's permission as she was too young, but you'll notice that I didn't post full-face photos of her and never revealed her name. There came a time - during our separation - when my partner wasn't necessarily happy about everything I was posting, but I tried to be as sensitive as I could to his feelings during that time. Basically I described events and wrote about my own feelings but never second guessed him or tried to get inside his head. I figured our story was mine to tell, but only from my point of view. This has given rise to some criticism from people who said I was self-centered or that the story was one-sided but this was deliberate. I didn't feel I had the right to tell other people's stories. 6. Is it hard to meet people in real life when they know so much more about you than you do about them? 7. After Petite Anglaise you wrote a second book, a novel, French Kissing. Was it difficult to change genres? Why did you choose to write a novel as your second book? I wanted to try something different and prove to myself and my publisher that I could pull off writing fiction. I also wanted to take a step back from writing purely about me and reclaim some of my privacy. French Kissing was a compromise in the sense that I took some (familiar) themes that I care a lot about - such as how a single mother is expected to behave differently to any other woman in certain situations - and created the story around them, informing it with some of my experiences. I wrote in the first person, but the main character wasn't me. It was actually very liberating to be able to invent scenes and conversations to my heart's content, rather than trying to dredge them up from my memory and render them as faithfully as I could. It was a longer, harder process, but ultimately very rewarding. 8. The French are known for appreciating artists. Is France a good place to live as a writer? I don't think I've ever really grown to feel like I own the label 'writer' so I don't really know. I'm liable to mutter something with red cheeks about how I've taken time out from my office job to write a couple of books if someone I don't know asks me what I do for a living. Taxwise it's a pretty terrible place to live as a writer ;-) Ireland would be better! 9. Many writers hope they’ll get a book deal from their blogs. What would you tell them? You might have to be fired first! Seriously though, a blog can be a good place to experiment, and occasionally, if the blog has a big following, it can be a 'shop window' to showcase your work. But the ratio of the number of bloggers who have been published to the number of blogs that exist must be 1 to several millions... I don't have any illusions about why my blog got picked up. If I hadn't been fired and my case discussed in the media, publishers would never have come knocking. 10. Is getting fired the best thing that ever happened to you? It certainly worked out well for me as far as the book deal was concerned, but it was a horrible experience and even when I won my employment tribunal case it still left a nasty taste in my mouth. It's going to come up in search engines in connection with my name for the rest of my life, so let's hope it doesn't cause me any problems in the future. 11. Blogging. Two books. What’s next? Catherine Sanderson is better known to the thousands of readers of her personal blog as "Petite Anglaise". A 37 year-old Brit who has been living in Paris for fifteen years, Catherine hit the headlines in July 2006 when the British firm where she worked as a secretary discovered her blog and terminated her employment. A French employment tribunal later ruled that Catherine had been unfairly dismissed and awarded her substantial compensation. The press interest brought several publishers to her door, and Catherine signed a two-book deal with Michael Joseph (Penguin) in September 2006. 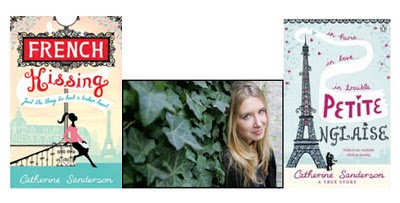 Foreign rights to her first book, Petite Anglaise, were also sold in the U.S., Canada, Germany, Italy, The Netherlands, Finland, Poland, Iceland, Israel, France, Brazil, and Lithuania. The book has been translated into ten languages. Great interview. I will have to check out her blog and books. Thanks for sharing. Now, if only I had a job from which to get fired - then I'd be all set! Glad you enjoyed the interview. If you're a blogger, you'll love Petite Anglaise. Fantastic interview! I haven't read her books yet but I will defintiely pick them up! Not cringing in the morning is not to be underestimated! I guess it's true that money doesn't buy happiness. My paranoid former employer took my blog to task as well and tried to use it against me after making my position redundant, threatening all kinds of litigation, libel and slander. Never mind that it was anonymous and no names mentioned. Was more amused that they obviously spent ages dissecting it trying to figure out who was who from the nicknames assigned. Am now out of there and much happier. Interestingly I still see them 'snooping' around every now and then. My solicitor says there is a book in me somewhere. Here's hoping! That's hilarious. What is up with all of these paranoid employers? I never really blogged about work (even though I really wanted to!) while I was there with the exception of non-work related stuff that happened in the office. But after I was laid off I couldn't help but write about that experience because it was so different than the process in the United States. And it also helped me cope with the situation as well. Always enjoyed Petit Anglaise, good to meet the author so thanks Chantal. Speaking of blogs-to-books, Petite Anglais is a movie I'd like to see! I agree. It would make a great movie! Anything in the works, Catherine? Great interview, thanks for posting Chantal! It's interesting to read how the blog influenced Catherine's real life choices - that element of display is becoming more and more important. I agree. I think I wanted to ask her that because sometimes I wonder if I do certain things just for the sake of writing about them later. I know when I went abroad, something in the back of my head told me it would make for good stories. Something to think about. Great interview, thank you with regard to placing Chantal! It truly is useful you just read the fact that blog site inspired Catherine's actual life World best ibeacon options : which component of exhibit will be getting increasingly significant. Fantastic job interview, thanks intended for publishing hyper based marketing Chantal! It's intriguing to read how the web site affected Catherine's actual life possibilities -- that will portion of exhibit can be becoming more and more crucial. Excellent work you have shared here Thanks a lot. There area unit quite few, sensible best online essay writing services out there, however most of those corporations do not rent them as a result of they sometimes charge plenty additional for educational papers. 38. It was always in my mind to read on this subject. I truly appreciate for your wonderful contribution over the same. I would like to read more from your blog site. This website is very helpful & acquainted to us because we got many tricks and tips on essay writing. Numerous students find essay composing a cumbersome and unpleasant assignment.If you receive the approach Read more click what is the best essay writing serviceyou discover that essay writing isn't painful at all. Actually, it can be an extremely fun and fulfilling procedure. I’ve always wanted to read on Cheap Essay Writing Service. I truly appreciate your wonderful contribution. I’d like to read more from your blog site. thanks for accept all comments . lets read my new article about like typo text,,ect. Hire a limousine service sydney for your Pick and drop and Point To point service!! Contact us to hire a limo service for your Airport Transportation and much more!!! If you look for the Dubai top resume writing companies and need help with it, just follow the link provided below and get the five start assistance with your resume. These guys are great, real professionals, take my word for it. That is silly. What is up with these suspicious bosses? I never truly blogged about work (despite the fact that I extremely needed to!) while I was there except for non-business related stuff that occurred in the workplace. However, after I was laid off I really wanted to expound on that experience since it was so not the same as the procedure in the United States. MS OneNote Customer Service Furthermore, it additionally helped me adapt to the circumstance also. An interview of the writer has been published for the provision of the knowledge. All the elements of the interview and resume-writing-services.reviews/livecareer-com-review/ have been ensured with the help of the new writers of the world. The production of the material is utmost for the success of the students.